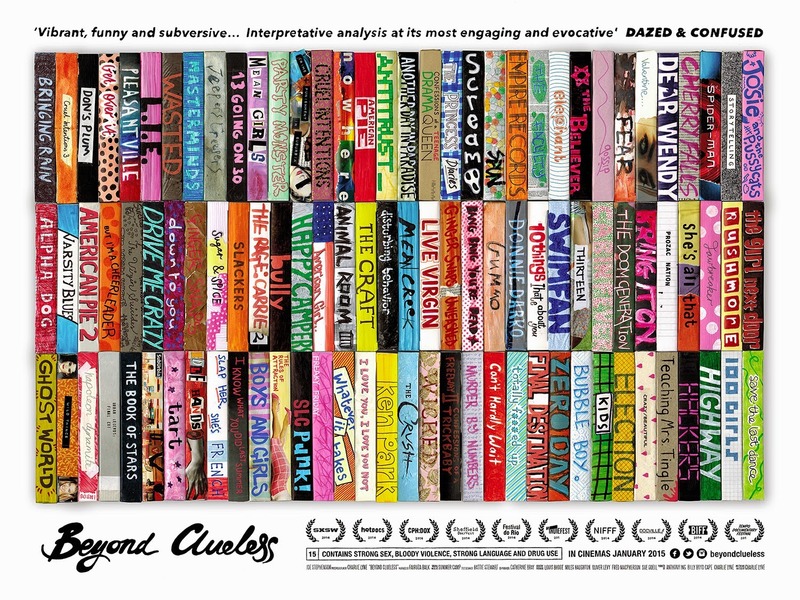 Beyond Clueless is a beguiling, often contradictory film; one which hypnotises and obfuscates with equal measure. A patch-work, mix-tape movie, Charlie Lyne's documentary takes the form of a Mark Cousins-esque dream-scape essay to investigate contemporary "Teen" features. Yet, from the off, the thesis is entirely uncertain - what exactly is Lyne trying to identify or state? Fairuza Balk, the star of The Craft, narrates Beyond Clueless with a calm, measured tone which, unfortunately, does little to banish an air of aimlessness through which the film floats. During reading of selected "key texts" - including Bubble Boy, The Girl Next Door and Slap Her, She's French! - the film meanders with elongated passages which fail to resemble traditional analysis but border, instead, on lengthy regurgitation of synopses. Insight and poetry are kept to a minimum. Interspersed between these chapters, however, comes the segments which really save Beyond Clueless: the thematic montages. Splicing together clips from iconic, and not-so-iconic, moments in the Teen genre, Lyne uses an emotive soundtrack by Summer Camp to fashion together sequences which border on the euphoric. An early example includes an infinite procession of cliques striding down school corridors, edited in a weightless loop, a glistening, pulsing, throbbing, oozing, soundscape underpinning the action and offering a spectral grace to proceedings. A parade of thousands of amorphous faces, bodies and lives, glow from the screen, highlighting both the universality of the High School and the individual stories within - the experience is akin to standing in an echo chamber with hundreds of young adult stories reverberating around one's skull; an elevating experience. Yet, come the conclusion of Beyond Clueless, Lyne has said or shown nothing which has expanded our knowledge or understanding of the Teen movie or Teen lives. Indeed, as the clock ticks on, we're quite uncertain whether or not Lyne has even identified what a "Teen" movie actually is - few would argue that Twin Peaks: Fire Walk With Me, American History X or The Dreamers belong in a category normally associated with Bring It On. Omissions such as Angus are criminal too. Searching for consistency, or anything as lucid as meaning, in Lyne's experimental essay is a task most of us would fail at. Indeed, despite the positives, the montages constituting the prime examples, its impossible for our minds not to wander over the course of Beyond Clueless - when moments from Mean Girls, Clueless or Can't Hardly Wait flash on-screen, its impossible not to wish to be watching the entirety of these teen classics instead.